A short way from the intersection of 35th and Spring Garden streets sits a large white mansion surrounded by a brick schoolhouse, a meeting hall and a large lawn. At night, a single lantern can be seen hanging between the house’s two pillars and warm yellow light spills from its bay windows, welcoming visitors. 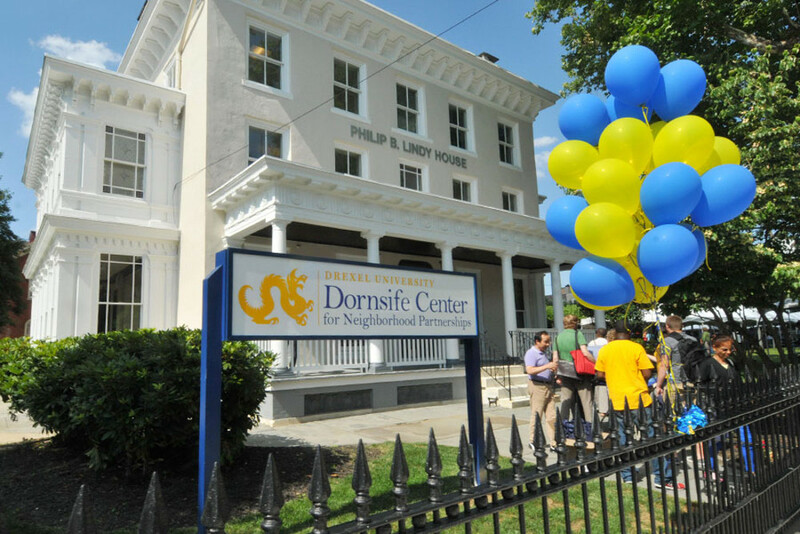 Built on 1.3 acres of land, the Dana and David Dornsife Center for Neighborhood Partnerships, located at 3509 Spring Garden St., opened June 12, 2014, as an urban extension that works in collaboration with Drexel University to provide a range of services to those in the Powelton and Mantua community. Stepping into the house, one is greeted by an open room, adorned with a dark wooden fireplace and a small couch where Amy Wen, with shoulder length black hair and rectangular frame glasses, sits prepared to talk about the Dornsife Center. After graduating from Drexel with a bachelor’s degree in communication, Wen came to work for Dornsife as their logistics coordinator. “I wanted to do more event planning but I didn’t want to do weddings, baby showers — that kind of event planning. I wanted it to be more meaningful. [This position] fits what I want to do, plus I get to work within the community,” Wen said. With the plethora of events and programs offered at Dornsife, Wen is never short of work. The Center has several ongoing programs, but works intermittently with other partners for special events in order to promote healthy lifestyles, job training and fun opportunities for the Powelton and Mantua neighborhoods. For example, on the first Tuesday of every month, the Center holds a community dinner where members from all around Powelton Village, Mantua, Drexel University and West Philadelphia come together for a free meal. Over the past six months, the dinner has been provided by Drexel culinary students in a side-by-side course where half the class consists of Drexel students and the other half consists of members from the community, according to Wen. “Our community members from West Philadelphia, they’re cooking and serving, so it’s pretty awesome to see them work hand in hand. And it’s great to just see everyone talking to each other and meeting new people, and meeting their neighbors,” she said with a smile. However, the monthly gathering isn’t just for food and friendship, it’s a time for learning as well. Before each community dinner, the center holds a workshop called Writers’ Room, run by Rachel Wenrick, a Drexel professor at the College of Arts and Sciences, along with Kirsten Kaschock, another Drexel professor, and Jen Jolles, a graduate student. Each month, community members are given a topic to write about. The previous theme for December was The Rhythm in Our Words: Writing in Response to Music. Throughout the month, members were encouraged to work on their writing with aid from Drexel faculty. In the two hours before the dinner, they were then given the opportunity to share what they created. The center also offers other opportunities for neighbors to get involved in different fields. A Music in Production course teaches adults how to make music using computer software. A Laughter Yoga class and various dance classes promote exercise in hopes of decreasing heart disease and promoting a lifestyle of wellness. There is even an Astronomy Night run by Drexel’s Department of Physics that welcomes attendees to use their telescopes as well as take a trip to the on-campus observatory. All of these events, except for the dance classes which require a one-time $5 fee, are free. Through the help of grants and the partners who cover the cost for programs that are brought in, community members are able to get the most out of the Dornsife Center without having to empty their pockets. The Center also has a free computer lab, stylized as KEYSPOT, that offers aid to community members searching for jobs or seeking career development in addition to technology training and adult education programs. According to a participant profile by the Dornsife Center, Mantua resident Lamont Twyne used these resources to start his own catering and food service business. “I have taken full advantage of the wonderful training programs offered here, and attended some of the monthly community dinners too, which brings the community together,” Twyne’s profile reads. “The many resources are so helpful as well. I have successfully applied for my [limited liability companies], [employer identification number], website address, and other start-up things I need to launch my new food service business,” it continues. Twyne’s implementation of the KEYSPOT computer lab provides a direct example of how Dornsife is currently helping West Philadelphians cross what has become known as “the digital divide,” a term that refers to the gap between demographics with access to modern information and technology, as well as those with very limited access or, in some cases, no access at all. Wen said the digital divide is exceedingly prevalent between certain Philadelphia communities. Thus far, it seems that the Dornsife Center has been successful in reaching out to the surrounding community and engaging with the University’s neighbors. This is only the beginning of a relationship that will strengthen and develop over the years to come.